Approximately 30 million people are affected by liver disease globally, and the quest to find donors for liver transplants is difficult. There is a lack of functional livers available compared to the liver disease patient population. In some cases, a portion of the liver from a living donor is sufficient for regular function. Stem cells are unspecialized cells that can differentiate into a variety of cells. Researchers have been trying to utilize stem cells to create various organs and body parts in order to aid patients who lack functional ones due to injuries or diseases. 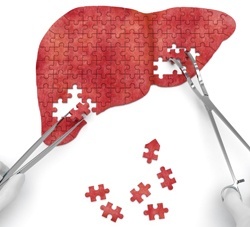 Previous strategies tackled liver disease by liver cell transplant, which required rare donors. This approach is viable for about a year, but eventually an organ transplant has to be performed. Scientists have also tried to use human-induced pluripotent stem (iPS) cells, but those cells were not mature enough to differentiate into functional liver cells. Therefore, a better treatment to eliminate liver disease is needed. The Saban Research Institute of Children’s Hospital research team in Los Angeles produced a tissue-engineered (TELi) liver from human and mouse liver organoid units (LOU). They implanted these units into a murine, mouse-related, model and included various cell types, such as hepatocytes, bile ducts, and endothelial cells. The mouse hepatocytes present expressed albumin, a key protein required to regulate osmotic pressure in the blood. Other components of the liver incorporated bile ducts expressing CK-19 and vascular structures that contained alpha smooth muscle actin expression. Within four weeks, there was a major development in the differentiation of albumin expressing cells in the TELi. While previous transplants required perfusion, this therapy does not, which will minimize cell loss. This therapy also does not require the use of immunosuppression or cell reprogramming. Overall, this study may be able to produce novel initiatives for cellular therapy, whereby donor liver organoid units could be transplanted into patients to generate a fully functional tissue-engineered liver. October 20, 2016 in 2016-17, Biology, Medicine, Uncategorized.